September | 2015 | Dan Moore! it? What do they do with it? What do you want to be able to do with the site? What do you want it to look like? Or if an employee is unhappy in their role, ask them to “wave the magic wand” and talk about what role they’d rather be in. With no constraints you find out what really matters to them (or what they think really matters to them, to be more precise). When you think about issues through this lens, you focus on the ends, not the means. It lets you think about the goal and not the obstacles. Of course, then you have to hunker down, determine if the goal is reachable, and if so, plan how to reach it. I like to think of this as projecting the vector of the ideal solution into the geometric plane of solutions that are possible to you or your organization–the vector may not lie in the plane, but you can get as close as possible. 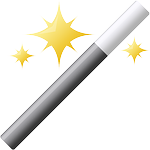 “Waving a magic wand” elevates your thinking. It is a great way to think about how to solve a problem not using known methods and processes, but rather determining the ideal end goal and working backwards from there to the “hows”.